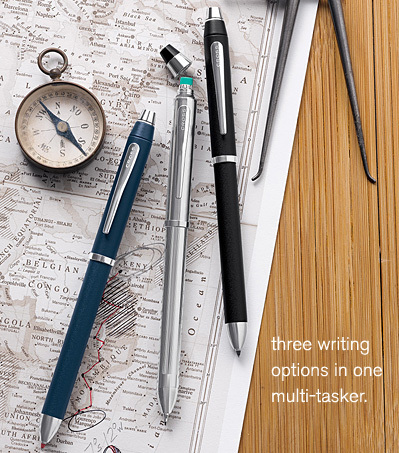 Summary: Triple play - three writing options in one clever multi-tasker. 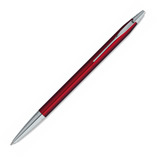 With a smooth twist of the barrel, switch from a black ball-point pen to a red ball-point pen to a 0.5mm pencil. Includes: one black and one red fine ball-point refill, five pencil leads and a pencil eraser. Chrome-plated appointments. 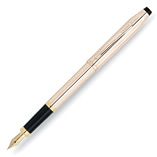 Summary: Writing elegance at its finest: the world-famous Classic Century design presented flawlessly in 18 karat gold. 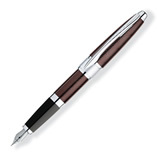 This exquisite ball-point pen makes a breathtaking gift that will be treasured for a lifetime. Summary: Renowned Cross quality and a soft rose-gold hue create a writing instrument to be valued for a lifetime. 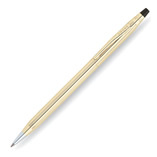 The Classic Century ball-point pen features a cap and barrel in our exquisite 14 Karat Gold Filled/Rolled Gold finish—a beautiful and durable treatment that is higher in gold content than traditional gold plate. 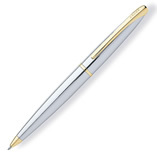 Summary: Preferred over gold plate for its greater gold content and wearability, our 10 Karat Gold Filled/Rolled Gold finish on the cap and barrel of the Classic Century ball-point pen complements the elegant and timeless design of this American icon. Summary: The ATX Medalist is a highly polished chrome with 23 karat gold plated appointments. A winning combination in the popular two-tone finish. Summary: The two most popular of all writing instrument colors, black and chrome, combine to create an exciting new look in the ATX Basalt Black ball-point pen with chrome plated appointments. Summary: The warmth and beauty of rose gold in the incomparable Century II design. This exquisite fountain pen features a 14 Karat Gold Filled/Rolled Gold cap and barrel and 18 karat gold nib. 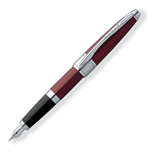 Summary: Apogee Titian Red Lacquer fountain pen is pure poetry without writing a word. Perfectly proportioned pen features a rounded, highly polished, spring-loaded clip. It is accented by the wide, satin finish center ring. 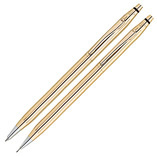 Fountain pen nib is 18 karat solid gold. Summary: Pulsating with the glitz and glamour of 1980’s-era Manhattan, this fountain pen with a solid 18 karat gold/rhodium plated nib, flaunts a pale blue European translucent lacquer over an engine-turned patterned engraved chrome. Polished chrome appointments create a subtle contrast, for the cool, connoisseurs of fashion. Summary: A two-texture treatment in chrome: a subtle satin finish combined with smooth, ultra-brilliant chrome plated appointments. 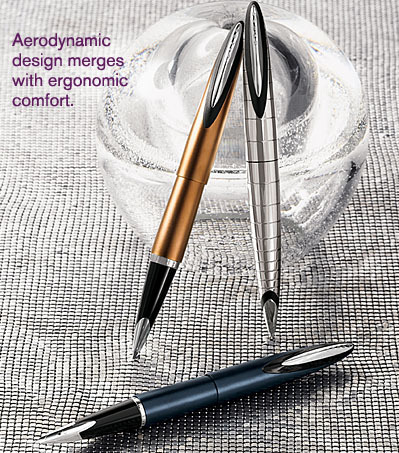 A stainless steel nib completes the sleek lines of the ATX Matte Chrome fountain pen. 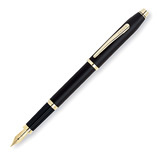 Summary: ATX Medalist fountain pen is polished chrome and 23 karat gold plated appointments. 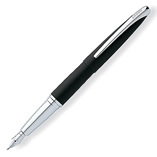 This fountain pen features a stainless steel nib. Summary: The two most popular of all writing instrument colors, black and chrome, combine to create an exciting new look in the ATX Basalt Black fountain pen with chrome plated appointments and stainless steel nib. Summary: A satin black finish and 23 karat gold plated appointments make a definitive statement of style in this Century II fountain pen with 23 karat gold plated nib. Summary: Writing elegance at its finest: the world-famous Classic Century design presented flawlessly in 18 karat gold. This exquisite ball-point pen and 0.5mm pencil set makes a breathtaking gift that will be treasured for a lifetime. Summary: Elegance expressed in aerodynamic form. 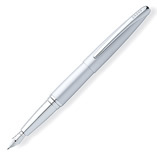 The unique design features a spring loaded clip that retracts until at one with the body of the pen, for a seamless, uninterrupted look. Fountain pens have our exclusive 360° wrapped rhodium plated stainless steel nibs. Summary: As streamlined and aerodynamic as a fine Italian racing bike, our newest slim swivel-action ball-point sports an inventive flat-to-flare twisted clip. A winning combination of precision Cross engineering and agile styling with a translucent sateen finish, polished and brushed chrome-plated appointments. Customize yours with engraving and get ready to take the lead.